Chicken, bacon and ranch is a beloved flavor combination known to be a comfort food classic, so I was excited to lighten it up into these Chicken Bacon Ranch Wonton Cupcakes. I’m not even a huge ranch fan, but I loved these. They taste so decadent you will never believe they’re only 152 calories or 4 Weight Watchers SmartPoints each. 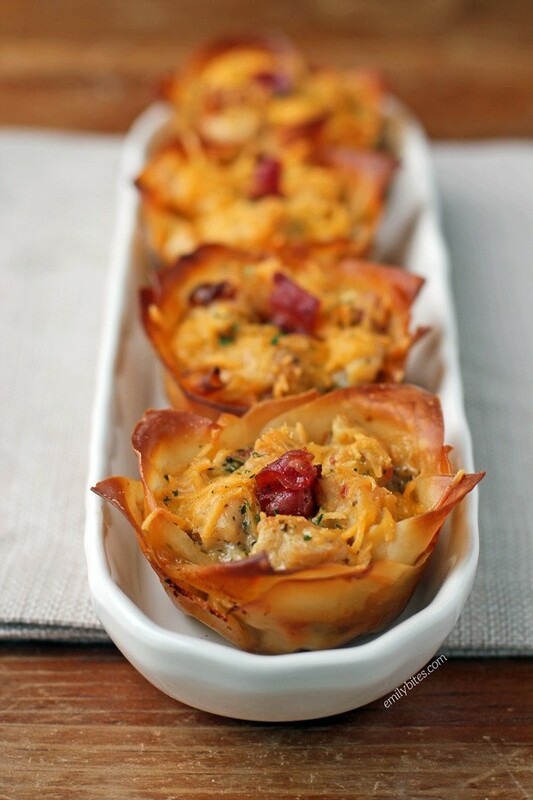 These crispy wonton cups are bursting with seasoned chicken, crisp bacon, creamy ranch dressing and sharp cheddar cheese. Tell me you’re not drooling just thinking about it. I won’t believe you! Not only are these Chicken Bacon Ranch Wonton Cupcakes sinfully delicious and surprisingly light, they’re also really easy to make and they come together quickly, so they’re a perfect weeknight meal. I like to have two wonton cupcakes with a veggie side dish and at that point I’m usually full, but I can grab a third if I’m still hungry. I love that kind of easy portion control! Place the uncooked chicken strips into a Ziploc bag and sprinkle with the ranch seasoning. Seal the bag and shake/massage until the chicken is coated with the seasoning. Bring the canola oil over medium heat in a medium sized skillet. When the oil is hot, add the chicken pieces and stir them around to coat with oil. Arrange them into a single layer and cook for 5-7 minutes, flipping occasionally, until the chicken strips are cooked through. Remove the chicken to a cutting board and chop into small pieces. Place the chopped chicken into a mixing bowl and stir in the chopped bacon and ranch dressing until well combined. 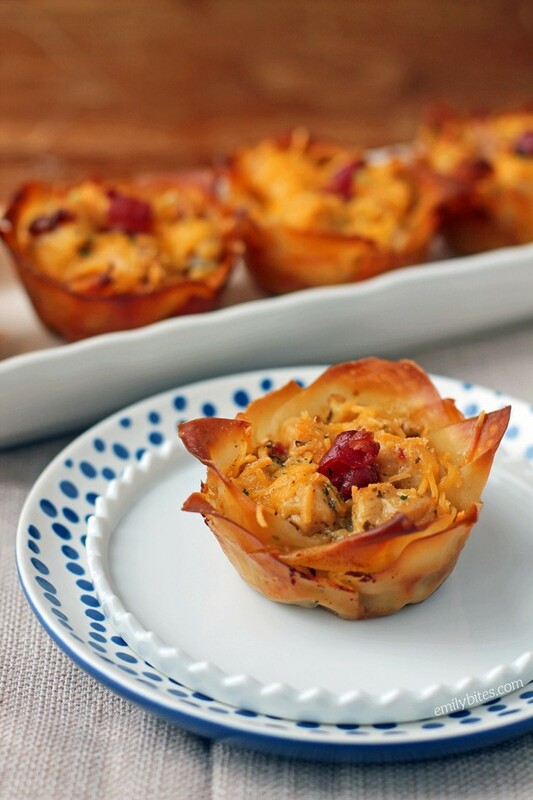 Push a wonton wrapper into the bottom of each of the sprayed cups in the muffin tin. Using about half of the chicken mixture, spoon evenly into the wonton wrappers. Sprinkle about half of the shredded cheddar evenly over the top of each cup. Press another wonton wrapper on top and repeat the layering steps with the remaining chicken mixture and shredded cheddar. I would never be able to tell that these were lightened up! I am going to make them next time I need a savory appetizer. Do you ever make any of your wonton recipes ahead of time and freeze them? These were amazing! We are huge fans of your wonton recipes! I’m old school…do you have a cookbook in print? Would love to get one. Made these tonight. They are fantastic! I enlisted my 12 year old daughter to help make these tonight because she loves to get in the kitchen. She loved making them and loved eating them even more! We all loved them-even my picky 10 year old. Thanks for another great recipe! Do these reheat well? With only 2 in my household, there would definitely be leftovers. I’ve made an EB recipe every night this week. I made the taco cupcakes last night and these tonight so we didn’t waste the wrappers. Your videos on IG inspired me. So good! Hubby and my toddler loves both. Thanks a ton for your hard work. We appreciate it. Is fat free cheese ok to use or is the 2% better? To be 100% honest with you, I personally think most fat free cheese is gross and it doesn’t melt well, but if you like it then you can definitely use it! I just found your blog and I was wondering if I could use ground chicken to save a few steps. Also, what is the best way to freeze and reheat? I live alone so freezer meals are great for me. What would you serve as a side dish with these if they were a “main dish” for your dinner? Probably a salad or some roasted veggies. We love to roast broccoli, carrots, cauliflower, zucchini, anything really! Made these yesterday & they are delicious! I just made these. They are so amazing. I will make these again.